John Hitch for Industry Week: The singularly defining moment in Artificial Intelligence (AI)—even bigger than when IBM's Deep Blue beat chess master Gerry Kasperov—happened back in in 2011 when the unbeatable Jeopardy! 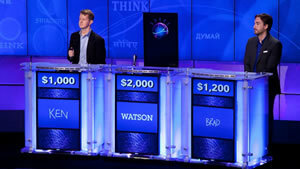 Champion Ken Jennings was finally taken down by IBM's new supercomputer, Watson. "I felt obsolete," the rust-haired computer programmer said after IBM's supercomputer Watson usurped his position. "I felt like a Detroit auto worker of the '80s seeing a robot that could do his job on the assembly line." Jennings, who won 74 matches of the trivial knowledge game show in a row, explained in a TedTalk that he thought there was no way the AI could pick up on the various clues' nuances and double meanings. Watson, it turns out, was not only a fast thinker (16 TB of RAM) with a great memory (1 TB), it also understood context. It cleaned the stage floor with Jennings, beating him by $53,147. With that victory under its belt, Watson has moved on from the game show circuit to uses its powers and contextual brilliance to take on something even bigger: manufacturing.